I saw an old man walking along the beach a few days ago. His crooked back leaned so far over that it looked like his head sprouted from mid-chest. He walked like an unsteady robot, half his joints fused together, stiff limbs, short steps. Two dogs ran circles around him, each about a foot tall with fluffy fur, one black one white, threatening to trip him at any moment, their leashes tangled in a giant knot around his feet. 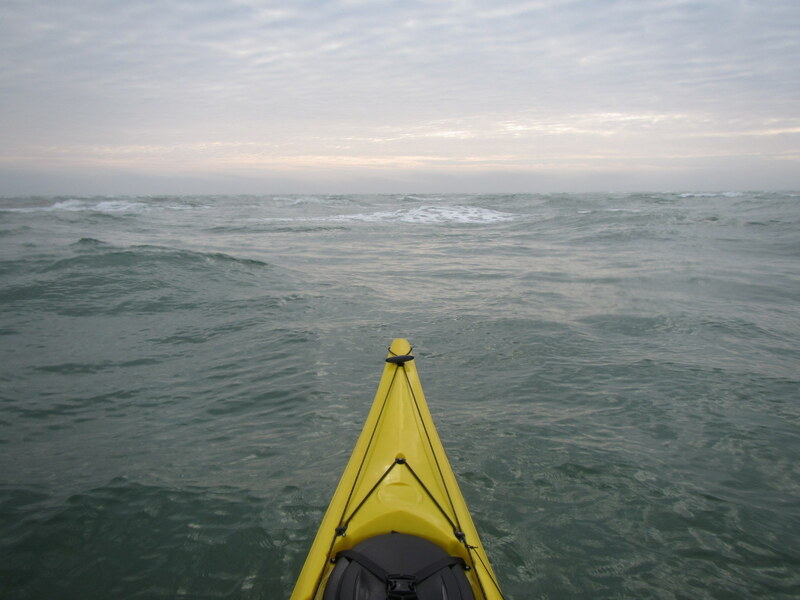 I saw him and paddled hard outside the breakers with arms built over three-thousand miles to do nothing other than paddle. He left me behind like a dragster, shrinking in front of me down the beach until he disappeared into a house, the two dogs winking away with him. “Damn this wind,” I thought. And I think the same thing today. I’ve thought it every day for two weeks. I’ve yelled, I’ve smashed my paddle into the water, I’ve pouted. I wanted to call the police and complain, to sue the wind in small claims court for mental anguish, to punch it in the face. But I can’t do anything to the wind. It blows where it wants and doesn’t care. All I can do is watch old men pass me on the beach and learn something profound about patience. At least I’ve done one of those two things. Posted in Angle to Key WestTagged Angle to Key West, frustration, old men, speed, windBookmark the permalink. No better lesson D. It is to your credit that you can appreciate that lesson. I think you have done both of those two things. Keep strokin Daniel. Hey D. While paddling up a rapid on the American River, I took a break, looked up the river, and saw the snow capped Pyramid Peak far away above the river. I thought of you for a moment and how you walked under that mountain a couple years ago on the PCT. You did that and you can do this. Keep going.